English poet, painter, engraver; one of the earliest and greatest figures of Romanticism. 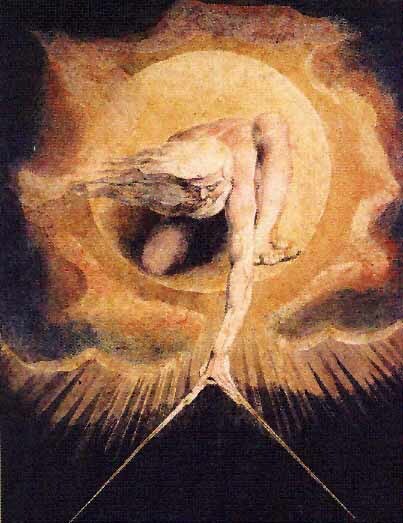 “I do not behold the outward creation… it is a hindrance and not action.” Thus William Blake–painter, engraver, and poet–explained why his work was filled with religious visions rather than with subjects from everyday life. 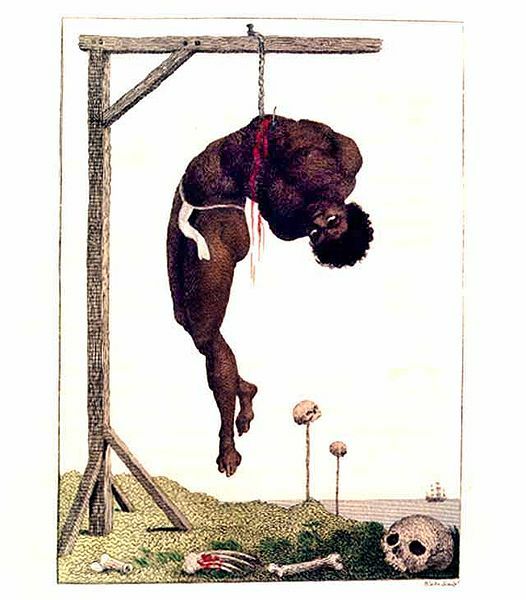 Few people in his time realized that Blake expressed these visions with a talent that approached genius. He lived in near poverty and died unrecognized. Today, however, Blake is acclaimed one of England’s great figures of art and literature and one of the most inspired and original painters of his time. Blake was born on Nov. 28, 1757, in London. His father ran a hosiery shop. William, the third of five children, went to school only long enough to learn to read and write, and then he worked in the shop until he was 14. When he saw the boy’s talent for drawing, Blake’s father apprenticed him to an engraver. At 25 Blake married Catherine Boucher. He taught her to read and write and to help him in his work. They had no children. 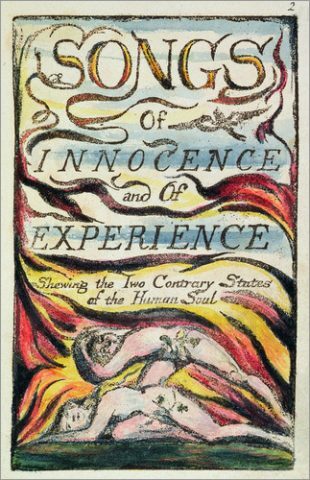 They worked together to produce an edition of Blake’s poems and drawings, called Songs of Innocence. Blake engraved both words and pictures on copper printing plates. Catherine made the printing impressions, hand-colored the pictures, and bound the books. The books sold slowly, for a few shillings each. Today a single copy is worth many thousands of dollars!!! Blake’s fame as an artist and engraver rests largely on a set of 21 copperplate etchings to illustrate the Book of Job in the Old Testament. However, he did much work for which other artists and engravers got the credit. Blake was a poor businessman, and he preferred to work on subjects of his own choice rather than on those that publishers assigned him. 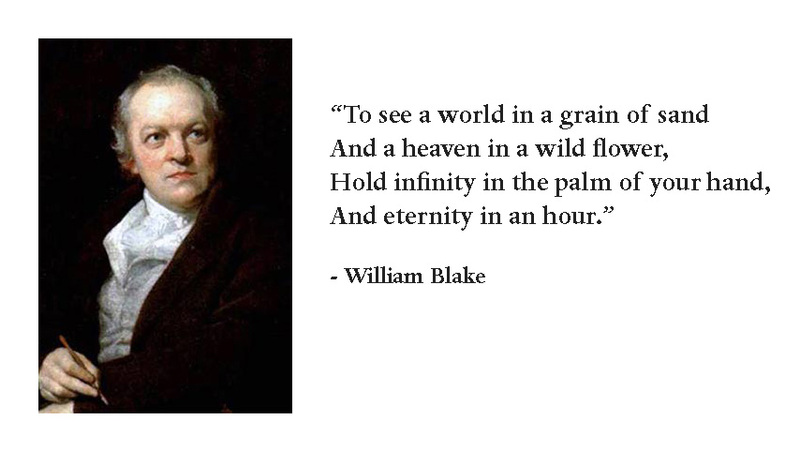 A follower of Emanuel Swedenborg, who offered a gentle and mystic interpretation of Christianity, Blake wrote poetry that largely reflects Swedenborgian views. Songs of Innocence (1789) shows life as it seems to innocent children. Songs of Experience (1794) tells of a mature person’s realization of pain and terror in the universe. But as well as writing poetry that revealed and exposed the harsh realities of life. William Blake never lost touch with his heavenly visions. Like a true Seer he could see beyond the ordinary world and glimpsed the light of the beyond. This poem from Auguries of Innocence is one of the most loved poems in the English language. Within four short lines he gives an impression of the infinite in the finite, and the eternal in the transient. Because of Blake’s temperaments he was not always suited to maintaining friendships. On one occasion he got into trouble with the authorities for forcing a soldier to leave his back garden. He faced the possibility of jail, but through being his own defence counsel, he was able to gain acquittal. Blake was very much a free spirit who readily spoke his mind, so much so that some acquaintances thought he was mad. 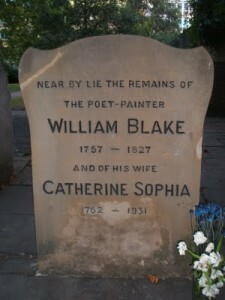 Blake died on August 12 1827, he was buried in an unmarked grave in a public cemetery and Bunhill Fields. After his death his influence steadily grew through the Pre-Raphaelites and later noted poets such as T. S. Eliot and W. B. Yeats. If you visit the British Library in London (it is a must! 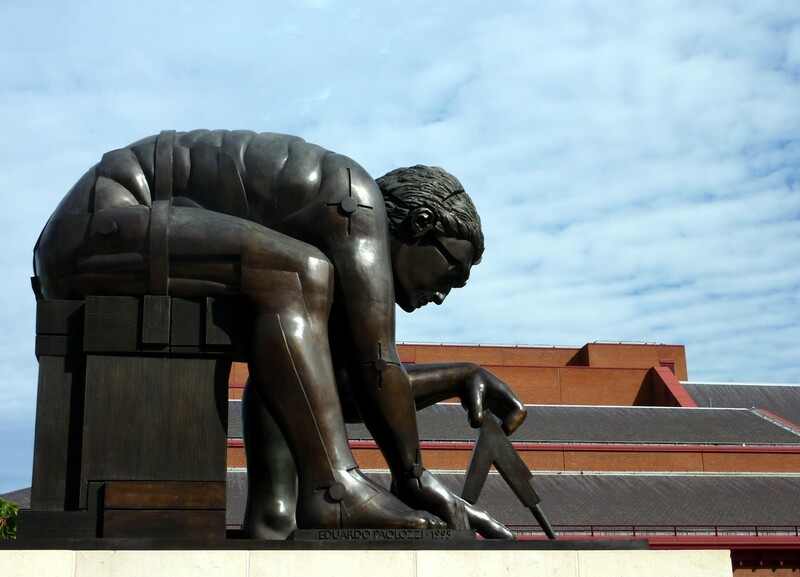 ), you are welcomed by Paolozzi’s Newton (based on Blake’s Newton, as you can see below). 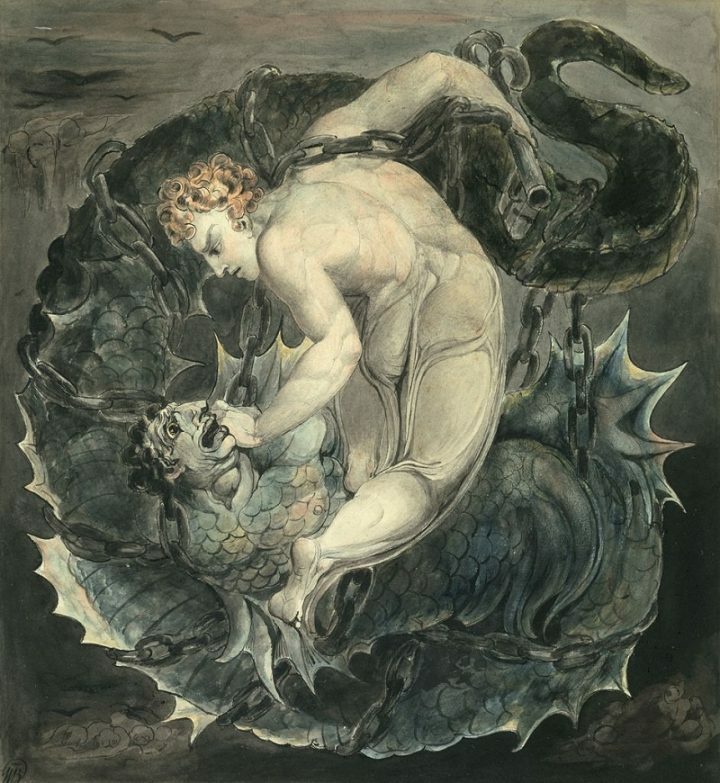 Since his death, William Blake has been claimed by various movements who apply his complex and often elusive use of symbolism and allegory to the issues that concern them. In particular, Blake is sometimes considered (along with Mary Wollstonecraftand her husband William Godwin) a forerunner of the subsequent 19th-century “free love” movement, a broad reform tradition starting in the 1820s that held that marriage is slavery, and advocated for removal of all state restrictions on sexual activity such as homosexuality, prostitution, and adultery, culminating in the birth control movement of the early 20th century. Blake scholarship was more focused on this theme in the earlier 20th century than today, although it is still mentioned today notably by the Blake scholar Magnus Ankarsjö who moderately challenges this interpretation. The 19th-century “free love” movement was not particularly focused on the idea of multiple partners, but did agree with Wollstonecraft that state-sanctioned marriage was “legal prostitution” and was monopolistic in character. It has somewhat more in common with early feminist movements (particularly with regard to the writings of Mary Wollstonecraft, whom Blake admired). Blake was critical of the marriage laws of his day, and generally railed against traditional Christian notions of chastity as a virtue. His poetry suggests that external demands for marital fidelity reduce love to mere duty rather than authentic affection, and decries jealousy and egotism as a motive for marriage laws. In his poem “London” he speaks of “the Marriage-Hearse” plagued by “the youthful Harlot’s curse”, the result alternately of false Prudence and/or Harlotry. For Blake, law and love are opposed, and he castigates the “frozen marriage-bed”. In the early 20th century Pierre Berger described how Blake’s views echo that of Mary Wollstonecraft celebrating joyful authentic love rather than love born of duty, the former being the true measure of purity. 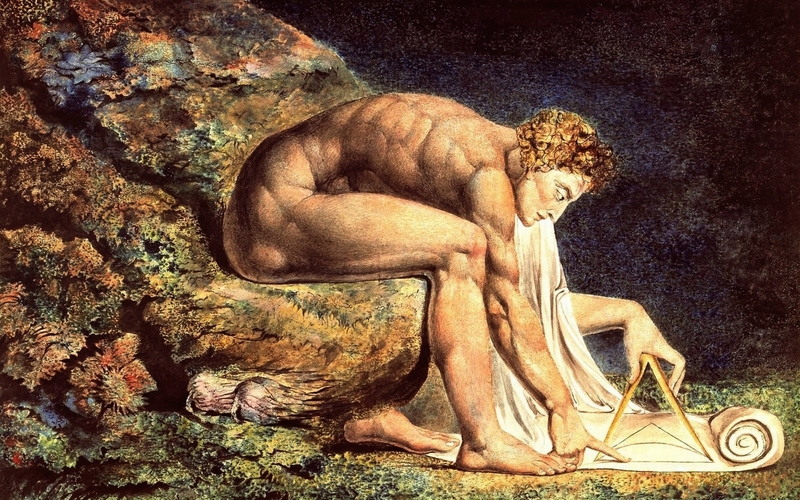 Blake designed his own mythology, which appears largely in his prophetic books. This mythology seems to have a basis in the Bible and in Greek mythology, and it accompanies his ideas about the everlasting Gospel. Men are admitted into Heaven not because they have <curbed &> governd their Passions or have No Passions but because they have Cultivated their Understandings. The Treasures of Heaven are not Negations of Passion but Realities of Intellect from which All the Passions Emanate <Uncurbed> in their Eternal Glory. 2. That Energy, called Evil, is alone from the Body, & that Reason, called Good, is alone from the Soul. Blake does not subscribe to the notion of a body distinct from the soul, but sees the body as an extension of the soul, derived from the ‘discernment’ of the senses. He saw the concept of ‘sin’ as a trap to bind men’s desires (the briars of Garden of Love), and believed that restraint in obedience to a moral code imposed from the outside was against the spirit of life. He did not hold with the doctrine of God as Lord, an entity separate from and superior to mankind; this is shown clearly in his words about Jesus Christ: “He is the only God … and so am I, and so are you.” A telling phrase in The Marriage of Heaven and Hell is “men forgot that All deities reside in the human breast”. This is very much in line with his belief in liberty and social equality in society and between the sexes. 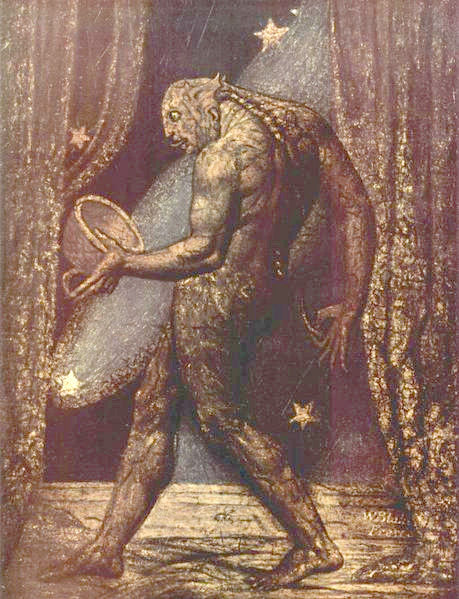 From a young age, William Blake claimed to have seen visions. The first of these visions may have occurred as early as the age of four when, according to one anecdote, the young artist “saw God” when God “put his head to the window”, causing Blake to break into screaming. At the age of eight or ten in Peckham Rye, London, Blake claimed to have seen “a tree filled with angels, bright angelic wings bespangling every bough like stars.” On another occasion, Blake watched haymakers at work, and thought he saw angelic figures walking among them. Error is Created Truth is Eternal Error or Creation will be Burned Up & then & not till then Truth or Eternity will appear It is Burnt up the Moment Men cease to behold it I assert for My self that I do not behold the Outward Creation & that to me it is hindrance & not Action it is as the Dirt upon my feet No part of Me. What it will be Questiond When the Sun rises do you not see a round Disk of fire somewhat like a Guinea O no no I see an Innumerable company of the Heavenly host crying Holy Holy Holy is the Lord God Almighty I question not my Corporeal or Vegetative Eye any more than I would Question a Window concerning a Sight I look thro it & not with it. “I soon encountered Blake’s peculiarities and [was] somewhat taken aback by the boldness of some of his assertions. I never saw anything the least like madness, for I never opposed him spitefully, as many did – but being really anxious to fathom, if possible, the amount of truth which might be in his most startling assertions, I generally met with a sufficiently rational explanation in the most really friendly and conciliatory tone. Even when John Varley, to whom I introduced to Blake, and who readily devoured all the marvellous in Blake’s most extravagant utterances – even to Varley, Blake would occasionally explain unasked how he believed that both Varley and I could see the same visions as he saw – making it evident to me, that Blake claimed the possession of some powers, only in a greater degree, that all men possessed, and which they undervalued in themselves but lost through love of sordid pursuits – pride, vanity, and the unrighteous mammon”. Through his artwork, Blake communicated his deeply spiritual visions and intensely original interpretations of the world in which he lived. His works have also inspired and influenced countless others to make their own art — both visual and musical. Understanding Blake the poet cannot be done disjointly from Blake the artist. Have a look at his paitings/etchings. Should you ever visit the Tate in London or the National Gallery of Victoria in Melbourne (Australia), you cannot miss Blake’s works. Another great museum in London, not widely known to the average tourist, is the Fitzwilliam Museum. I was mesmerized when I stepped inside, so I highly suggest you going there. 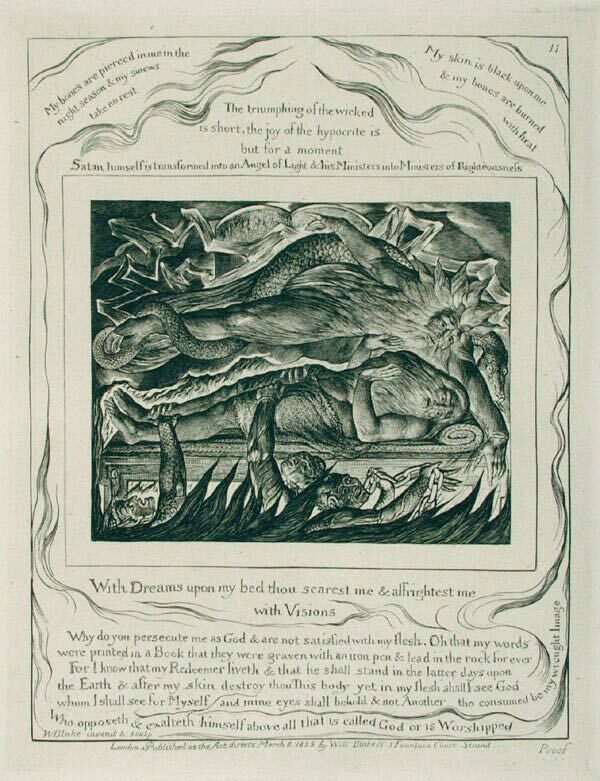 You will find some of William Blake’s engravings. John Linnell was one of the most highly regarded and successful artists of his day and formed an impressive network of connections. He was William Blake’s last patron. John Linnell and William Blake first met in 1818. They formed a close friendship which lasted until Blake’s death in 1827. Linnell became his last major patron. He introduced Blake to personages who might buy his work and regularly purchased items for himself (the Fitzwilliam has Linnell’s own copies of a number of Blake’s works). 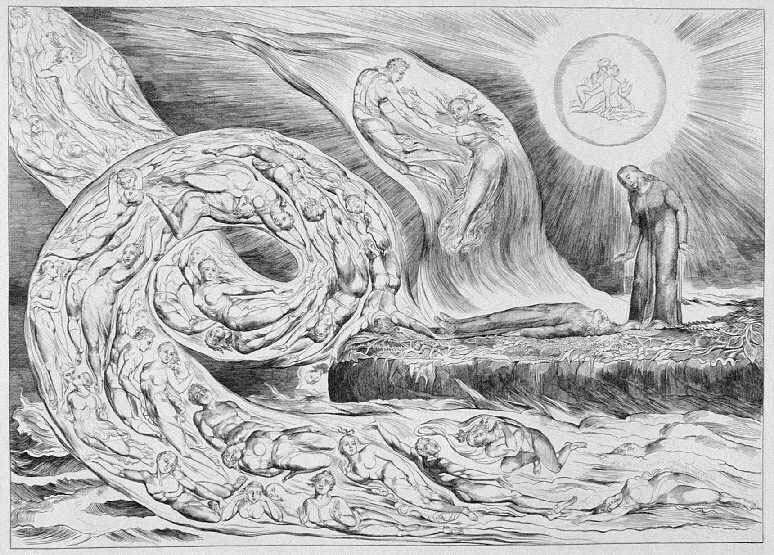 However, it was with his commissions in respect of the Book of Job and Dante’s Divine Comedy that Linnell was able to support Blake for the final years of his life. Linnell also introduced Blake to a number of younger artists (including John Varley and Samuel Palmer) who in turn introduced others. Thus due largely to Linnell, Blake spent the final years of life in the presence of a circle of admirers. This group of disciples was known as the Ancients and consisted of Samuel Palmer, George Richmond, Edward Calvert, Francis Oliver Finch, Frederick and Arthur Tatham, Henry Walter, Welby Sherman and John Giles. See how much work it takes to make an engraving. Click here to watch a short video on “the techniques of making engravings”. Really impressive, isn’t it? The following are some quotes I like that I would like to share with you. Which ones do you like the most? Is there a quote you find particularly relevant to our times? Particularly contemporary for other reasons? Almost a foreboding for what our country is going through, since so few funds are given to promote the arts. Then, almost a worldwide prophecy of the evils of consumerism and total dominance of blind trade, at the expense of the expression of the self. Every Harlot was a Virgin once. For the Sexes: The Gates of Paradise: [Epilogue] To The Accuser who is The God of This World. 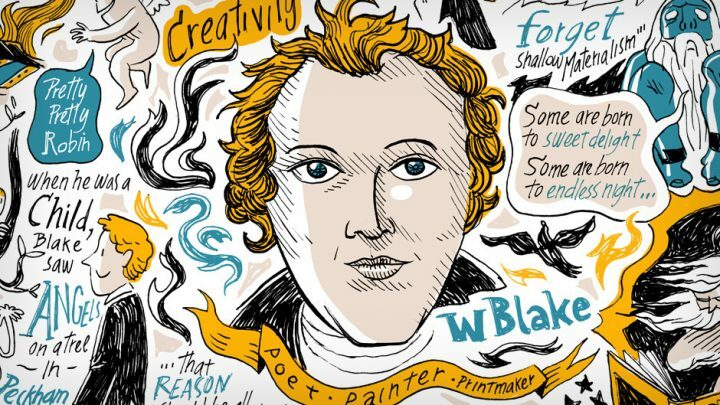 Watch the documentary on William Blake’s life and take some notes. Do you agree with Blake’s statement: Attraction and Repulsion, Reason and Energy, Love and Hate, are necessary to human existence. Why (not)? Why are his poems considered “profound and disquieting”? 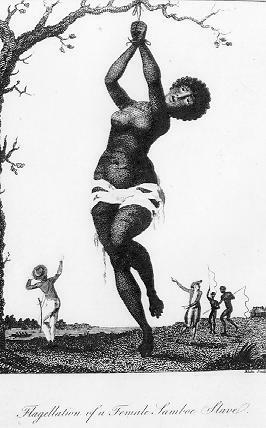 What do Blake’s etchings based on Graham Stedman‘s “Life in Surinam” denounce? Who was Thomas Butts? William Hayley? Why was Blake’s prophetic book “Jerusalem” a “vast undertaking”? Who turned their back on him? Why? What did Coleridge think of him? Blake is thought to have been driven by a fanatical belief in his own missions. The following documentary will cast light on the intricate and complex nature of this great artistic figure. What does his poetry depict? What do the two literary experts think of his visions? What name did Blake give to Jesus? What are “sleep and awakening” to him? What did he think of Gothic art? What was “Albion”? What did the “New Jerusalem” stand for? What were the “native poets” to him? Who did Blake take a dislike of? Why? What did Blake think of the Academy? Why did he despise Newton? What is the difference between the “living universe” and the “mechanistic universe”? His influence on modern-day poets, songwriters, artists, filmmakers, novelists, cartoonists and graphic novelists has been tremendous. Thus, a strong case can be made for calling Blake the most important poet/artist of all time. Blake was the first genius to turn poetry and art into ideological weapons to be directed against the establishment. As a result, Blake became a major influence on radical poets like Walt Whitman, William Butler Yeats and Alan Ginsberg and on rebellious singer-songwriters like Bob Dylan, John Lennon, Jim Morrison (The Doors were named after Blake’s “Doors of Perception”), Patti Smith, Kris Kristofferson, Joan Baez, Joni Mitchell and Bono. The modern graphic novel can clearly trace its roots to Blake’s illuminated poems and prophetic books. Its seems likely that every major anti-war and anti-orthodoxy figure since Blake has been influenced to some degree by him. Blake’s poetry is as emotionally liberating as it is intellectually challenging. Through his poetry Blake communicates a deep love of mankind and his belief that we are far more elevated in stature than traditional religion has us believe. Yet, we are a fallen people, not from God, but ourselves. According to Blake, the path to liberation lies inside each us. We need not wait for “One Greater Man,” (as Milton wrote). Our salvation is a personal one, one that is ironically prevented by the limitations we place on ourselves. According to Blake, human society and its institutions were sick, and the cure required a combination of revelation, imagination, right thinking, compassion, fierce tenacity and love. He believed the black-robed priests of religion had nailed a “thou shalt not” sign over the garden of earthly delights, robbing adults of pleasure and children of hope. He vowed to not let his pen rest in his hand until he had won the “Mental Fight” to transform the dreary London of his day into a new Jerusalem. 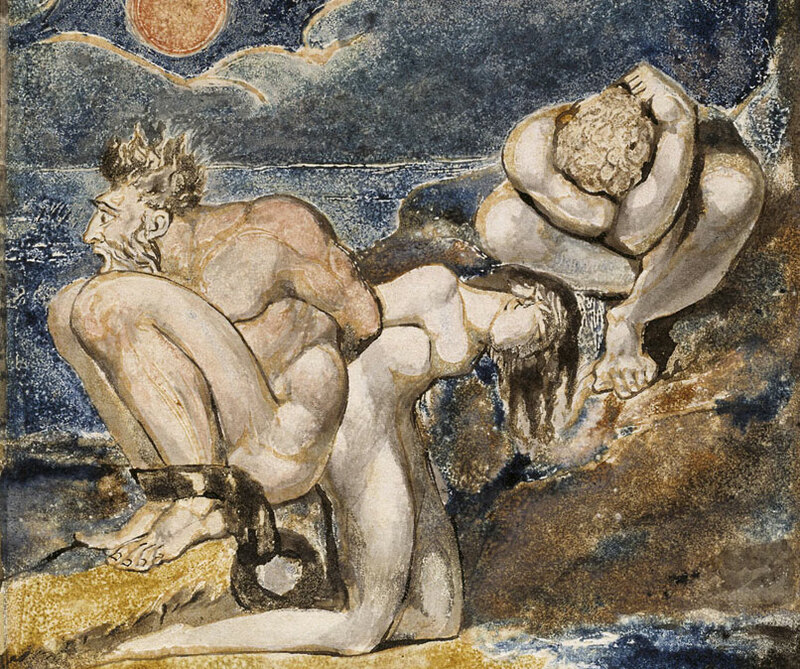 William Blake was a truly revolutionary poet and artist: was he the first Modernist? Blake shares a number of similarities with the other great English Romantics, but he goes beyond them in breaking with the past (one of the hallmarks of modernist art). Blake was not one to praise God or Nature, nor to write about knights, chivalry, honor and adventures. Another hallmark of modernist art is invention: doing things in nontraditional ways. 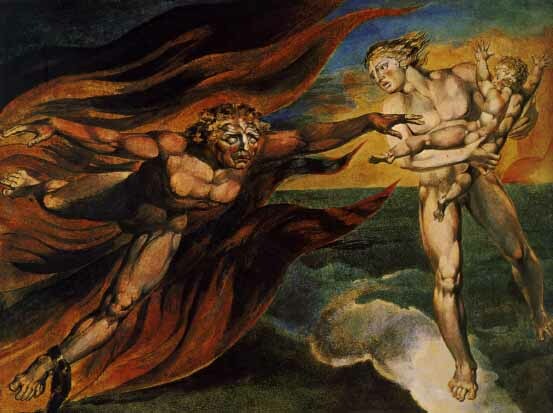 Alicia Oistriker, a leading Blake authority and editor of the Penguin Complete Poems of William Blake, claims that “The Argument” (plate 2) of the “Marriage of Heaven and Hell” is the first example of free verse in the English language. Blake also employed slant rhymes and metrical variation in some of his more formal poems, perhaps helping to blaze new trails for poets who followed, such as Emily Dickinson and Wilfred Owen. And then there are Blake’s innovations and inventions related to his engravings. A third hallmark of modernism is a focus on the individual and his/her imagination. Here again, Blake was a trendsetter. While other poets praised Christ or were at least careful not to say anything heretical, it seems Blake saw himself as being his own Christ. That was quite revolutionary for Blake’s time. Watch the videos and browse this webpage or the Bristish Library webpage for a deeper understanding of this great poem. If you are interested in two approachable interpretations of the poems, resort to this one or this one. You can watch this video too. I would like you to observe the way this lecture is delivered and let me know what you think about it. Listen to a short podcast dealing with both poems The Lamb and The Tyger. Listen to the poems and to what the speaker says about them. Listen and jot down the main points raised by the speaker. We will discuss them in class. Listen to the podcast and take notes. What extra info have you been able to gather from the podcast? Did you find it useful to a better understanding of the poem? This blog gives you the chance to see some essay writing based on the poem “London”. The bbc website provides you with useful comments and an interesting video.